Sue MacIntyre’s chapbook is a gem. It’s a small book that fits neatly into a pocket and so can be read easily on trains and buses. It’s beautifully produced with a bright green cover that begs you to open it and as you do so you are faced with 18 bicycles all standing alone on the small page. London is, indeed, green city. I read some of the poems while I was travelling around London and I became more alert to all that the city has to offer in its back streets and in the less obvious ways. The twenty three poems can be read as one long poem or twenty three separate poems that complement each other. There are no titles to the poems: each one represents an aspect of the green within a city. 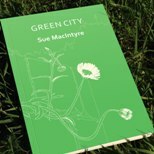 Sue MacIntyre has found something to be celebrated in the ordinary everyday life of a city dweller. to the window, I and my cup of tea. There’s sense of space and special space that is only found in crowded cities. bearing down on our smallness. The above lines come from my favourite poem in the sequence. So much is said in so few lines. But this is MacIntyre’s skill. Every poem offers the reader some wisdom from the everyday – or, to quote A.A. Milne, ‘the extraordinary in the ordinary’. I found something strangely sad in this rather beautiful poem set in a busy street with Buddha looking on. But this is again MacIntyre at her best. Her poems are understated reflections and through the domestic details, the wider picture of city dwellers and life in its broadest meaning is portrayed. where girls on bikes flit by. MacIntyre is observant of all aspects of nature found in cities or anywhere: birds, plants, frogs, squirrels, are observed in minute detail. She has a keen eye for this detail when painting a word picture. And it’s the very precise detail that makes these poems work so well. These are not complacent poems that accept life as it is. There’s a yearning expressed in them, a yearning that we can all feel for time passing, maybe. I’m not sure what it is here but it’s here in the nitty-gritty aspects of living and forgetting. eye to eye with strangeness. the distant call of seagulls? I see this book as part of a dramatic sequence with different voices coming in and representing aspects of city life. I think it would work equally well read on the page or as a performance piece. Congratulations to the publisher and Sue MacIntyre for this lovely little book.